Someday you should watch 50 scruffy college students run around in the rain while wearing tuxedos. They exude mildy restrained energy, like a toddler waiting for a cup of hot chocolate. The students know they should at least pretend to care for the tuxedo itself while in the presence of their conductor. Yet the rain calls them into itself, and so they dash and dart, seeking approval from their compatriots and Mother Nature. Iglesia de Santa Catalina lies near the center of Valencia, Spain. 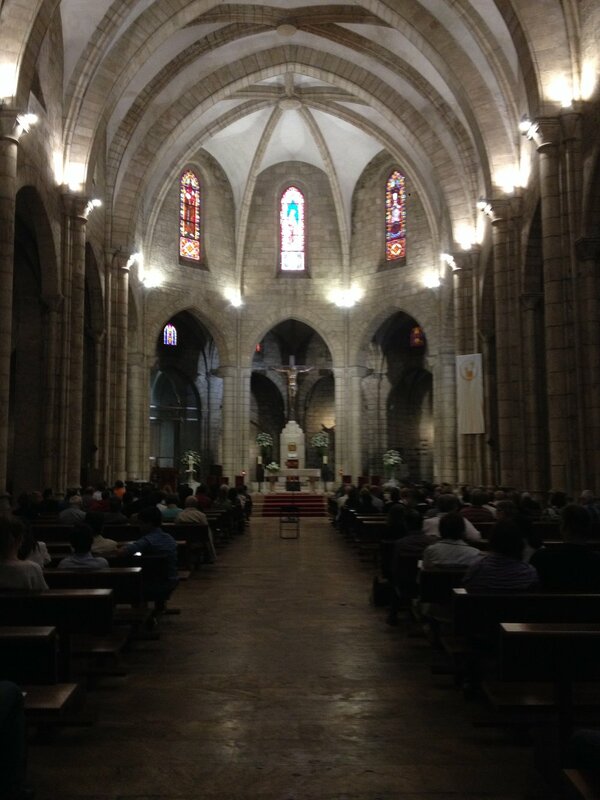 When the Glee Club sang at Iglesia de Santa Catalina in 2014 it was part of the 750th Anniversary of the site. The parish was built on the site of an ancient Mosque, and the footprints of thousands of worshipers have tread on the ground. The building itself is only a few hundred years old. Its white stone facade rises like a Tetris piece amongst narrow, winding streets peppered with restaurants and shops. Fortunately there is a small plaza just off-center from the front of the church which provides enough room for one to stand back from the building and catch a view of the bell tower rising nearly 200 feet into the air. It rained on the night we added our footsteps to the 750 years of history. We arrived at the church a couple hours early, figured out how to stand in the deep, dark, and cavernous sanctuary, became somewhat accustomed to singing in the room, and then allowed ourselves a bit of free time. Some of the guys explored the winding roads. Others, like me, found open tables at a cafe on the plaza, ordered coffee (clumsily snuck sips of wine), and watched the light patter of rain drop onto the worned cobblestone ground. I was suspicious of this place for the concert. The streets were too narrow. The roads too sinuous. The church was somehow made invisible by the commercial life that had raised around it. And the rain was a bad omen. We would be singing to an empty church. Yet the guys and I watched with curiosity and delight as umbrella-clad patrons slowly filed into the church. With the appearance of each concert-goer, the energy of the guys slowly raised. I sent a few quartets of guys to sing in the streets, hoping to entice more tourists and locals into the concert. 5 minutes before the concert, the guys were all gathered again and playing in the rain while hundreds of concert-goers waited for these toddlers dressed up in tuxedos. The concert began as one of those magic concerts — the kind where the audience loves the music before a song is sung. The kind where the invitation to the concert and the acceptance of the invitation is where the music truly began. The kind of concert where, if you’re paying attention, you stop to breathe deeply, slow your mind, engage your memory, and fill yourself with gratitude for all of the good things in your life, and sorrow for the goodbyes that lay in front of you. The penultimate song on our set was Franz Biebl’s “Ave Maria,” a standard for choruses for decades. The Glee Club has sung the Biebl hundreds of time. Anytime a music becomes a standard for a particular chorus, the music molds to the ideas of the performers. Everyone does it their own way. Biebl’s “Ave Maria” marries the familiar text of the Hail Mary with the Annunciation in the tradition of the Angelus, which dates back to the 11th Century (which is about as far back as the Iglesia de Santa Catalina). Soloist, And the Word was made flesh: And dwelt among us. Now the chorus sings as quietly as possible. Hail Mary, full of grace, the Lord is with thee. Blessed art thou amongst women and blessed is the fruit of thy womb, Jesus. The soft sounds of these men, who an hour earlier were dancing in the rain, capture the space. The audience’s silence mingles with the tones of the chorus, and we are one. It is incarnation and we are in its midst. The audience leans in closer, and the chorus concludes this repetition with a grand crescendo. The cadence, which in prior iterations is soft and contemplative transforms into something that blooms and propels everyone forward. And the chorus continues, Holy Mary, Mother God, pray for us sinners, now, and in the hour of our death. It is a plea that, from my perspective seems to age the singers. I can see the underclassmen recognize that they are participating in something generative and impossibly big. I can see the upperclassmen recognize that this is a threshold moment — possibly the final time they will sing these words, these harmonies, with these brothers. And I can feel the audience ache as they recall their own youth, growth, and thresholds. All that remains is the Amen. Mother Nature joins in the song. The barrier of the church walls was not enough to separate us from her. As if to remind us that this began with everyone becoming baptized in her rain, she unleashed a thunder clap that threatened to break the roof asunder. Inexplicably, the deep, dark and cavernous boom matched the rhythm of the souls in sanctuary and unleashed a primal plea from us all that had already been set to pitch and rhythm. The Glee Club sang the 8 measures of Amen with its expanding and contracting harmonies, its broadening rhythm, and it wrenched us all forward towards the final bar and into the sounds of an audience that could do nothing but join through applause, mimicking Mother Nature’s rain patter in the plaza. The 2014 performance of Ave Maria in Iglesia de Santa Catalina has gone down in Glee Club lore. Usually the guys are most excited to remember and relive the supernatural accompaniment. As for me, I love how the thunderclap marked the thresholds crossed. We had all felt rain and heard thunder before that night. The Glee Club had sung those notes and words countless times. But on that evening, music and nature joined to become an ebenezer for the transformations occuring in our lives. Immediately after the concert, the guys gathered out in the plaza and put their arms around each other. 50 scruffy men who had experienced something special could do nothing but embrace and sing a few more songs — in wet tuxedos.